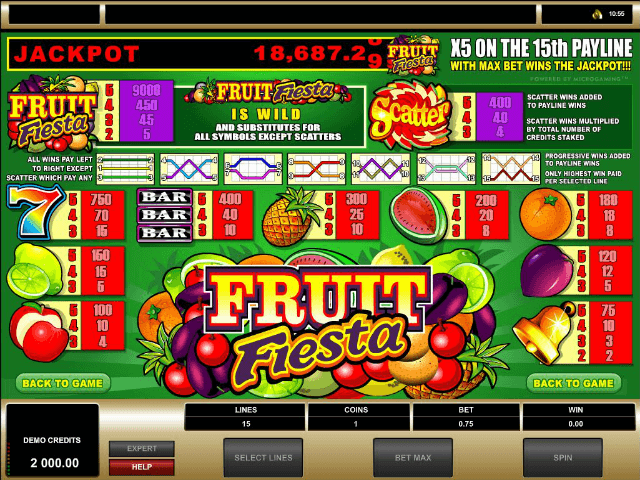 If nostalgia and healthy eating are your bag then Fruit Fiesta, a five-reel, 15-pay-lines offering from the ever-popular Microgaming stable may well be the video slot for you. 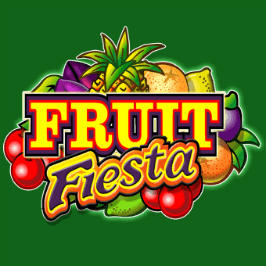 Along with a gentle nudge (thank you) towards the virtues of eating more fruit, Fruit Fiesta boasts intuitive gameplay and a sweet progressive jackpot. Play Fruit Fiesta for Real Money! Some of you may remember the three-reel version of the Fruit Fiesta video slot that came out a good few years back. Essentially, this updated variant provides better visuals and throws in two additional reels. Thus, Fruit Fiesta 2.0 has five colourful, fruit-packed reels taking up almost the entire screen with only a plain green backdrop and a paytable button for company. The Fruit Fiesta slot machine’s jackpot (9,000-times) is every bit as attractive as the vitamin C-packed produce spinning before your eyes. Of course, this doesn’t include the progressive jackpot, which is displayed at the top of the screen. The minimum bet is £0.05 per spin, while the maximum stands at £75. Do the maths and you’ll find a max wager of £450 could earn you a return of £675,000. Very tasty. 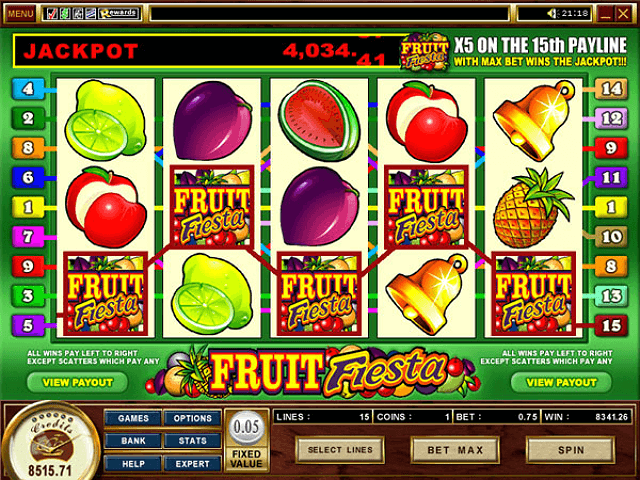 All of your fave fruit symbols from yesteryear are represented on the Fruit Fiesta online slot. Yes, we’re talking watermelons, pineapples, plums, oranges, apples and lemons. Other non-fruity (yet still traditional) icons on show are bells, triple Bars and sevens (of which there are several types). The apple, lemon, and rainbow-style sevens have the highest-value. Five of the latter will net you a cool 750 credits. 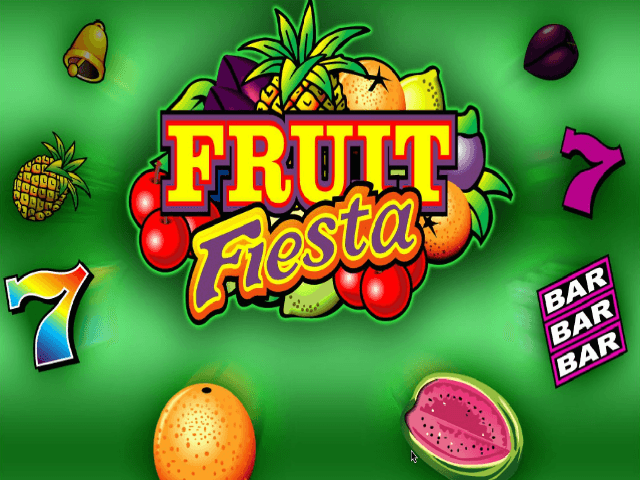 Fruit Fiesta lacks any real bonus features to speak of so you may initially be a little disappointed if free spins and sub-games are your thing. The Fruit Fiesta slot’s progressive jackpot tends to pay out handsome four-to-five figure sums at least once a fortnight (on average). You’ll need to get five of the Fruit Fiesta wilds on the 15th pay-line, and be playing at the maximum coin level, to make it drop. Whilst it may not be the most visually appealing slot around, or provide much in the way of bonuses and features, Fruit Fiesta is a solid and at times rather enjoyable what-you-see-is-what-you-get old-school fruity. The lucrative scatters and potentially life-changing progressive jackpot will keep you coming back for more. Share this Fruit Fiesta Review today! 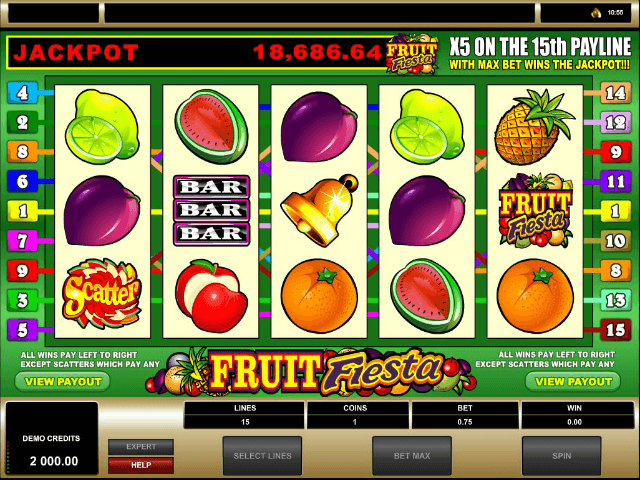 If you like Fruit Fiesta, you'll love these slot titles too!